Davido's 'Fall' Is Taking Over Radio Stations in U.S.
News Agency of Nigeria (NAN) reports that she reached out to Davido's team through an Instagram comment on his international manager, Efe Ogbeni's page @efe_one. Efe posted a photograph of himself and Davido with the caption, "Studio all week o. @davidoofficial album summer 2019 dropping. #africatotheworld." Tamar commented "Don't leave me off that. Thanks." 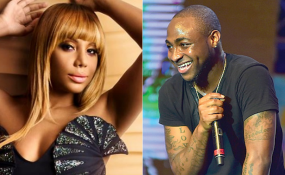 Tamar had hinted her love for Davido's music on Monday, when she shared a video of herself dancing to 'If' on her Instagram page for her birthday. In October, 'If' was number one on Shazam's chart above Lil Wayne's hit 'Uproar', Travis Scott's 'Sicko Mode' and 'Backin It Up' by Pardison Fontaine featuring Cardi B, among others. This made Davido the first Nigerian artiste to be number one on the New York Shazam chart. The song, alongside 'Fall' have remained two of his best charting songs since 2017.